As is often the case with Barbara Kingsolver’s novels, it took more time than I preferred to get hooked into Flight Behavior. But once engrossed, my persistence was proven worthwhile. Unlike her other novels, however, this one’s first chapter turned me off because it read like a steamy romance, something I was not expecting from a Kingsolver book. Luckily, the married protagonist’s early infatuation with a local boy is only a vehicle to push the story, rather than the substance of it. In modern day Feathertown, Tennessee, Dellarobia Turnbow takes to the wooded hills behind her farm for a rendezvous with a local younger man, consumed with thoughts of leaving her husband and the gossip such a betrayal would generate in her small town. Though Dellarobia is mother to two beloved children, her potential for happiness is curbed by a lackluster marriage, the loss of her parents, and an endless string of almost-affairs. Despite the fervency of her selfish thoughts on this particular day, the outside world begins to force its way into Dellarobia’s consciousness as she notices strange clusters of dark matter hanging from tree limbs. Looking to the opposite hillside, the far off trees appear bathed in brilliant orange flame, causing her to abandon her plans for a lover’s tryst. This marks both the end of the first chapter and, fortunately, Kingsolver’s attempts at harlequin romance. The inexplicable sight she witnessed soon becomes of crucial importance when Dellarobia’s father-in-law, Bear Turnbow, makes plans to log the hillside in a desperate attempt to pay off his ballooning debts. Dellarobia urges her husband Cub to take a look at the land before allowing his father to sell it off, alarmed by the mysterious sights she recently witnessed there but reluctant to voice the details for fear of giving her near betrayal away. When the whole family takes to the woods, encouraged by Cub’s conviction that Dellarobia’s advice was an act of God, they find the trees covered butterflies, millions of winged creatures colored in bold Halloween orange and black. As news of the phenomenon of monarch butterflies settling in rural Feathertown spreads, scientists, activists, and members of the media alike head South in droves. Kingsolver verges on the romantic again when biologist Ovid Byron sets up shop in the Turnbow’s backyard – his deep knowledge of these butterflies and his generousity incite some significant swooning in Dellarobia. Byron teaches not only Dellarobia but also her budding-scientist son, Preston, about the butterflies and what their recently altered migratory patterns mean. Under the veil of small town and family politics, Kingsolver fleshes out vast issues of global warming, social class, religion, and politics. The arrival of monarchs in Feathertown harks of a swiftly changing climate, however many of Feathertown’s locals routinely close their ears at the words “global warming.” Others, Dellarobia included, see such beauty in the monarchs, rendering it impossible for them to comprehend how such a spectacle of nature is actually a sign of sickness. While the significance of the changing migratory patterns of the monarchs is lost on many Feathertown residents, the changes it sets in motion for Dellarobia, from earning her own income to meeting like-minded people to discovering a passion for learning, become the source of conflict closer to home. Her interest in the butterflies becomes official with Dr. Byron hires Dellarobia as a research assistance, heightening tensions with Cub’s family who have long worried that Cub’s wife considered herself too good for their simple son and further dividing the loveless couple. Though she never strays from Dellarobia’s side, Kingsolver’s relationship to her characters is remarkably tenuous. The stubborn ways of Dellarobia’s in-laws, their resistance to accept scientific fact, their inclination to profit off the havoc of nature by charging admission to monarch-seeking visitors all feel quite antagonistic under Kingsolver’s pen. But as we become party to the nuances of Feathertown and Turnbow politics, Kingsolver’s attitude toward the locals turns more sympathetic. This is made quite plain when an environmental activist corners Dellarobia with his schpeal about changes she can make in her daily life to reduce her negative environmental impact. Stricken by poverty, the lifestyle suggested by this green-minded man is one which Dellarobia and the vast majority of Turnbowians are already forced to adopt – reducing flying, buying secondhand clothing, eating less meat, repairing instead of replacing broken machines and household goods. The coldness of Dellarobia’s mother Hester reads as pure evil at first, but reveals itself as a product of protective instincts more than malice. And despite the frigidity of Dellarobia and Cub’s marriage, Kingsolver’s loyalty to Dellarobia does not prevent her from highlighting Cub’s virtues and kindnesses. Though she at times paints Dellarobia’s family and neighbors as too simple, stubborn or thoughtless, Kingsolver also recognizes the integrity of their way of life as well as the motivations behind their ways of thinking and being. It’s almost as though Kingsolver created characters in such a way that readers, and maybe even the author herself, would be challenged to develop simplistic, black and white attitudes toward them. Though not exactly subtle, Kingsolver raises important and ultimately unavoidable questions through this elegant work of fiction. When Dr. Byron explains to Dellarobia the way in which these monarchs are a warning flag for the future of humanity, it is hard for readers to separate the worry Dellarobia feels for her children from that readers would hold for the young people in their own lives, facing a bleak future at the hand of environmental ruin. Kingsolver’s representation of Feathertown’s residents mirrors some of the widely-held attitudes toward Southerners and conservatives, but also challenges many of the associated stereotypes such that readers cannot help but consider their own private prejudices. 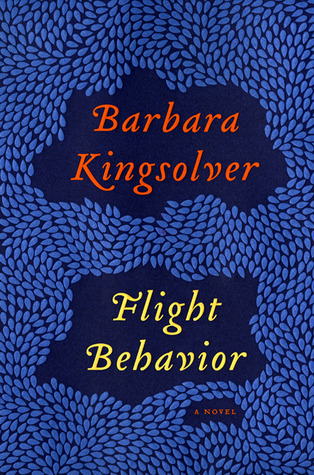 In fact, Kingsolver challenges many of our preconceived notions about others in Flight Behavior. She encourages non-judgment and seeing things for more than what they at first appear to be by exploring the break down of us versus them mentalities. And her suggestion that such tiny things as the butterflies, their patterns and behaviors, could mean so much for the larger world is a deeply appreciated ode to mindfulness. By posing such heavy issues for consideration under the guise of (sort of) science fiction, Kingsolver makes it impossible for her readers to avoid thinking about these urgent problems. There are certainly a few flaws I could site in Flight Behavior, including certain story lines left unexplored and others introduced for seemingly little reason. I imagine that over time, however, these things which felt like hiccups in Kingsolver’s brilliance will reveal themselves as totally minute or laced with meanings beyond my original comprehension. Either way, Flight Behavior was a beautifully written examination of the workings of nature, people and their differences, and how to understand both. And it’s another one to add to Kingsolver’s quite noteworthy collection.